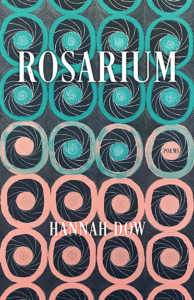 We’re super excited to announce that Acre’s fall title for poetry—ROSARIUM, a dazzling debut collection by Hannah Dow—is available for purchase! Though just released, the collection has already made the top of Rick Ripatrazone’s Must-Read list for November in The Millions. Check out the book trailer (in which the poet reads one of her amazing poems).